WASHINGTON Known as Joe Cool, World War I Flying Ace, Literary Ace, Flashbeagle, Vulture, Foreign Legionnaire and "that round-headed kid's dog," Snoopy symbolizes the simple yet effective way Charles M. Schulz expressed the anxieties and joys of childhood in the PEANUTS comic strip. Next month, the United States Postal Service will honor the comic strip and its creator with the issuance of the PEANUTS commemorative postage stamp. The first day of issue ceremony will be held at 10:30 a.m. (PT) on May 17 at Snoopy's Home Ice (the Redwood Empire Ice Arena), 1665 W. Steele Ln., Santa Rosa, Calif. The stamp will be available at the ceremony and at Santa Rosa post offices on May 17, and available nationwide starting May 18. The event is free and open to the public, and attendees are invited to enjoy a free skate after the ceremony until 2:00 p.m.
Snoopy is central to the comic strip and extremely popular for his imaginative adventures from atop his doghouse. An ensemble cast of children, however, makes the strip complete. Among them are the lovable Charlie Brown, who never gives up despite unending failure; the philosophical, blanket-carrying Linus; the fussbudget Lucy, who dispenses psychological advice for a nickel from behind a concession stand; and toy-piano virtuoso Schroeder. Charles M. Schulz began his fascination with comic strips early, reading the Sunday comics from four different newspapers with his father each week. With encouragement from his parents, Schulz enrolled in a correspondence course in cartooning. PEANUTS debuted in syndication on Oct. 2, 1950. On Feb. 12, 2000, only hours before his last original PEANUTS strip appeared in Sunday papers, Schulz died of complications from colon cancer in Santa Rosa. 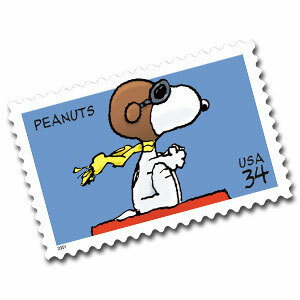 Illustrated by Schulz, and designed by Paige Braddock under the art direction of Carl Herrman of Carlsbad, Calif., the PEANUTS stamp depicts Snoopy in his role as the World War I Flying Ace. The name of the comic strip, PEANUTS, appears in the upper left-hand corner of the stamp. PEANUTS is licensed and syndicated by United Media (UM) a worldwide licensing and syndication company that focuses on building brand equity around a wide range of creative content.